But I do so love to visit with people and am really enjoying looking around your place. You have an amazing eye for taking pictures and you live in a beautiful area. The barn, the sky, those flowers...wow! What a blessing. Looking around here is like taking a breath of fresh air. I am glad you have a great weekend. It's hailed (ice rain) for the first time this year here in UK. other side of a fence. drove up on his tractor and asked him what he was doing. and now I'm going to retrieve it." and take everything you own." small disagreements like this with the Okie Three Kick Rule." The lawyer asked, "What's that?" times and so on back and forth until someone gives up." to abide by the local custom. last meal gushing from his mouth. his rear end sent him face-first into a fresh cow pie. "Okay, you old coot. Now it's my turn." I love the angle on this shot. Thai food yum - my favourite. That photo is beautiful, I always enjoy your pictures!!! Sounds like you had a good weekend enjoying what is left of fall! i love the colours!! so soft. great photo. Beautiful photo! I love that colour. we have yet to find a thai restaurant in our new town - i miss lemongrass in knoxville! Very pretty colors, is that a mum? Lovely color--hope you have a great weekend! Lovely photo! I like how the pink in the blurred background brings out the same in the flower. Ww: How beautiful a photo of this neat flower. You really captured the color of this mum. Nice composition too. The weekend was very lazy, yet again it flew by... hmmm. how does it do that! Lovely photo there, so warm and macro-y delightful! Do share more please! Wonderful photo! Love the colors. 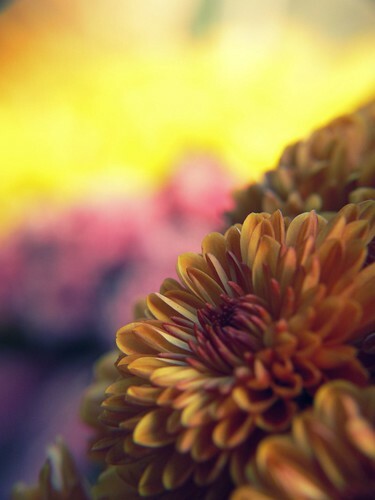 I love shooting mums in macro. They just have such a great detail for it. Love the angle of this shot. Great work! Beautiful colors & bokeh! Sounds like a wonderful weekend! An unusual and very beautiful shot of the flower. IN fact I'll say that's a BIG "WOW"! I love your giveaways ALMOST as much as I love your pictures. Oh, what a beautiful photo! Very nice shot, beautiful flower. That is a very nice angle on the beautiful picture. i could just stare at this photo allll day looong! the colors, the feeling of a mum autumn and the selective focus on the petals. it is a beautiful fall image and unusual for fall color. here i am! i decided to join rachel at work today for her 8 hour shift so i could have a little on-line time to visit everyone without the pressure of connection issues. This is totally beautiful, splendid! What beautiful flowers! Love the colors! look at that photo, I missed that earlier. amazing, gorgeous. I want to take photos like that!